5 Where I can get help and information? 6 How do I get sources? The JPA Diagram Editor enables the JPA developers to create, view, and edit their business data model as graphical diagram. For detailed information, see the project proposal. The JPA Diagram Editor recently passed successfully a Move Review. The code and the infrastructure of the project was successfully moved from the WTP Incubator to the WTP Dali project. JPA Diagram editor is a component of Dali. It's part of the Indigo and later releases of the eclipse. It's also compatible with Helios. JPA diagram editor offers full support for JPA 1.0. JPA 2.0 support development is in progress as well as support of additional JPA artifacts like embeddable classes and mapped superclasses. The editor already supports the new (JPA 2.0) style One-to-Many unidirectional relationship. I.e. - in JPA 2.0 projects the corresponding relationship attribute will be created with additional @JoinColumn(s) annotation, which means that the corresponding DB schema will be created without additional join table. This behavior is optional. The user may choose from the editor preference page or project property page to create this relationship (in JPA 2.0 projects) compliant with JPA 1.0 specification, i.e. - without the additional @JoinColumn(s) annotation. Download and extract Eclipse for Java EE Developers Helios. Go to Help -> Install New Software. 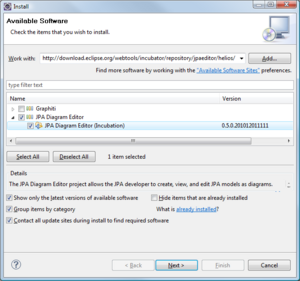 You need to select only the features from the JPA Diagram Editor category. The install manager will automatically pick-up the necessary Graphiti features. Follow the next steps of the wizard to install it. Where I can get help and information? How do I get sources? See the EGit User Guide for help using EGit. The build is based on Maven+Tycho, executed on Hudson server, hosted at Eclipse Foundation. New build is triggered automatically after a change committed in GIT. Currently only pure Java entities are supported. There is no mapping XML entities support yet. This page was last modified 11:36, 23 December 2014 by Robert Pofuk. Based on work by Petya Sabeva, Stefan Dimov and Alexander Silgidjian and others.